Fruitless Pursuits: Review: Tomb Raider 2013 (PS3). Crystal Dynamics' blood-drenched, "real world" rebirth of Lara Croft's Tomb Raider has hit store shelves early. Forget about street dates - we have tombs to raid! Well... sort of. Could be the first Tomb Raider game where raiding tombs is an almost an afterthought? Stick with me and I'll explain. A tiny part Far Cry, with a large portion of Uncharted, this is a Tomb Raider game unlike any other Tomb Raider game you've ever played, but a lot like all those other aforementioned franchise games you've played. Yes, it's a Tomb Raider game which feels like it was heavily inspired by Uncharted which originally felt like it was inspired by Tomb Raider. The snake is eating it's own tail. And yet All New Tomb Raider is still an extremely well polished, exhilarating action/adventure experience. I'll make more sense of all this... after the jump. I loved playing this game but before I sing all its praises I'm going to temper some of your expectations. I evoked Far Cry and with the stranded-on-an-island setting that perhaps should be expected. 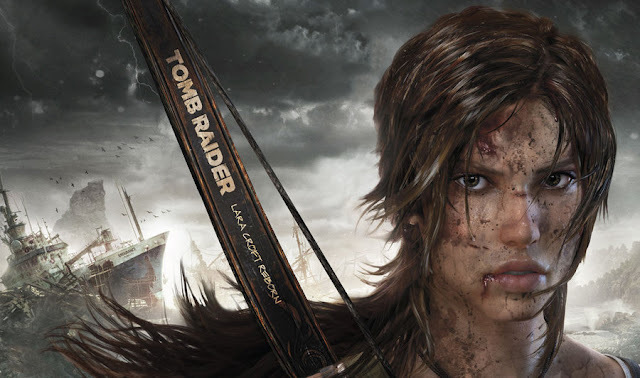 Equipped with a bow and arrow, Lara's fight to survive has also been highlighted in the marketing with references to hunting animals and gathering plants. And sure, these elements are there but they are extremely pared back, especially when compared to Far Cry 3. You hunt a deer for food early in the game as a bow and arrow and tutorial, and while you may choose to keep doing this for an experience boost throughout the game, you won't get a whole lot of opportunities. And compared to Far Cry - and all the other Tomb Raider games - the wildlife here is disappointingly sparse. Did you see the picture on the back of the box of Lara fighting a wolf? Yeah, well I'm sorry to say that wolves are the only aggressive animals that show up in the entire game. Compare that to the tigers, crocodiles and gorillas of previous outings and it feels very, very light. In fact, overall there's not a whole lot of variation in the enemies in this game: animal, human or otherwise, so it doesn't hold a whole lot of surprises. The game also lacks the scope and range of things to do that we experienced in Far Cry. There are open world elements and you can certainly stray off the beaten path and find rare treasures, plus a new fast travel system allows you to jump around to previous areas to further explore, but at its heart Tomb Raider is a linear action/adventure game with far more in common with the Uncharted series. You are continually funnelled from one action set piece to the next and I often felt like stopping to explore took away much of the story's momentum. Which brings us to the "tombs". They're not really Lara's primary objective at all. She is stranded on a mysterious, mythical Japanese island with a group of her wretched friends (they are a clumsily cultural diverse team of explorers that are about as a believable and likeable as Captain Planet's Planeteers) and your quest is really to solve the supernatural mystery that will get you home to safety). The "tombs" are really just side quests. Occasionally you will get a message that indicates that a "secret tomb" is nearby and some poking around will usually lead you through a tunnel and into an area where a puzzle must be solved in order to access some unspecified treasure. These are your typical lever/gear/pulley platformer puzzles that would be home in any of the previous games, but they're fun and sometimes challenging. I have only found a handful of them so far, so hunting these out will be the main appeal for continuing now that I have completed the main missions. Once you open the chest a message appears declaring "Tomb Raided" as though it's desperately trying to assure you that you are still in the business of raiding tombs. Honest! And our other limitation here is that we're tied to this one location. This is not a globe-trotting adventure where one minute we're in a tomb in Egypt, and the next we're in the South American jungle. Lara is stuck on this one island the entire time and as such we'll see a lot of familiar assets being used again and again. It's all beautiful to look at, but there was a point in the third act where I felt like a sequence was looking almost the exact same as a scene from the opening. In my opinion in holds the game back from reaching the heights of the Uncharted series which excelled at taking us to vastly different locations within a single game. But Lara is no Nathan Drake. At least she certainly lacks his scene-winning personality. But her latest re-imagining does make for a likeable character. They've nailed the look, bringing her successfully into the real world, and while she's a little too serious, you have to admire her tenacity. She suffers throughout the course of this game, becoming drenched in blood and filth and often staggering around clutching a freshly opened wound. She doggedly traipses through hell and you can't help but side with her. She doesn't talk as much as Drake when she's traversing the cliffs and caves, but my god, every time you stop by a campfire to level up and upgrade your gear, Lara suddenly won't shut up. As you allocate skill points and enhance your guns and bow, Lara will runs a stream of consciousness rant about how terrified she is and how she has to save every one of her dumb friends. (I did mention that I hated her dumb friends, right? I wanted to kill every single one of these assholes. And the US voice actors struggle with the word "Lara", shifting from calling her Lara, Laura, Laira and every other variant in between). And it may be a sexist thing to say but the fact that Lara is a plucky young female who is in over her head made her feel far more vulnerable to me. When going into a battle I was determined to duck and weave and protect her from being hit, feeling like she was going to go down fast if one of this giant meathead thugs actually got his hands on her. And I liked this aspect a lot because it made me feel more invested - like death was around every corner and that I really had to be smart to keep alive. I love that she's no longer an invulnerable superhero who flips ridiculously high in the air to avoid enemy fire. Now, instead she scramble awkwardly along the ground, dodging bullets, or messily rolls to the side. It looks and feels much better and raises the stakes. In fact I really must praise the combat overall, as this game is a lot of fun to play. I may have listed a lot of things it doesn't do, but everything it does it does extremely well. As you unlock new abilities, dodging and countering attacks is extremely intuitive and it's easy to chain these moves with blast from your gun or shots from your bow. And it's the best bow mechanic that I've encountered in a game in a long time. You can raise it and shoot with it incredibly quickly - although it stills feels right - so its a viable weapon to play throughout the entire game and I enjoyed the hell out of scrambling into cover and picking off three targets with arrows in rapid succession. The controls feel great, and not just because of what is there, but also what isn't. There's no stealth button to push, instead the game will automatically sense when Lara is near enemies and she will automatically duck down low and draw her bow in preparation. Similarly if you enter a low tunnel or walkway she will automatically crouch, and even light up a torch if her destination is a dark one. It's an intuitive process that assumes that you are going to be doing these things anyway and takes them out of your hands. To keep the wonderful cinematic feel of the game there's no visible user interface either, so nothing obscures or distracts from the stunning visuals. No health bars - no inventory items - nothing at all. Your health is managed by blood hitting the screen and your vision fading and if you do want to switch weapons then a non-intrusive tiny menu will briefly appear when you hit the appropriate button. But the game is far more concerned with your total immersion and this approach seamlessly blends the gameplay and cutscenes and makes you feel like you're participating in a film. The action set pieces may not be as huge or as varied as the Uncharted series, but the stakes felt just as high and I was definitely invested in Tomb Raider from start to finish and it got my adrenaline going more than most. It may be a little scaled back compared to other games, but it's consistently more exciting, simply because it handles everything so well. (Oh - except for the "rope arrow". The game feels really gritty and realistic until the point that Lara begins shooting massive lengths of rope on the end of her regular arrows and then climbing on them. And there's no limit to how much she does this - she has an infinite amount of rope and you'll be doing this A LOT. It almost turns her into Spider-Man and it was my biggest head-scratcher that momentarily broke my engagement with the story). The main storyline took me around ten hours to complete but, as I said, there's still plenty more to explore if I want to get back into it. There's a multiplayer mode to the game as well but when I went to test it I couldn't find any other players to get a game going. Possible that those servers aren't live yet seeing as how we're not quite yet at release date. But it's hard to imagine that the multiplayer will really factor too much into your decision to purchase this game. It's the main storyline that is the biggest drawcard. Now overall it may seem like I've criticised more than I've praised, but that's really because at this point in time my focus is on giving you as much information as possible to put you in the right mindset for what this actually is. As I've tried to stress, I really loved playing Tomb Raider and it easily held my interest throughout. It's a game with a hell of a lot of polish and you can see the love that's been poured into it and I would certainly embrace a sequel. I just hope that now that developer Crystal Dynamics have found their confidence with Lara Croft, that they can greatly increase the scope for the next one.